What Is The True History of, "WE SHALL OVERCOME"? 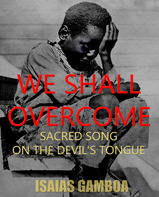 In his book, "We Shall Overcome: Sacred Song on the Devil's Tongue", Isaias Gamboa reveals never-before-published evidence that the anthem of the African-American Civil Rights Movement, "We Shall Overcome" was in FACT based on Louise Shropshire's hymn, "If My Jesus Wills", commonly known as "I'll Overcome"
All material is © 2015 - 2016 by Isaias Gamboa / We Shall Overcome Foundation unless otherwise specified. These text materials may be used, downloaded, reproduced, publicly displayed, or reprinted for personal or nonprofit educational research purposes only provided that the following attribution appears in all copies: “Reproduced with permission of We Shall Overcome Foundation, Beverly Hills, CA.” Also please include: "This information appeared originally at (www.WeShallOvercomeFoundation.org)." Permission is required for all other uses. The text reproduced from this web site must not be modified in any way. The We Shall Overcome Foundation is a non-profit public charity. We are not attorneys. The information provided on this site is intended to serve the public and is strictly educational and informational in nature. It is in no way intended to serve as legal advice or counsel. WHO WROTE, WE SHALL OVERCOME? WHO OWNS, WE SHALL OVERCOME? DO I HAVE TO PAY TO USE, WE SHALL OVERCOME? IS "I'LL OVERCOME SOMEDAY" by REV. CHARLES ALBERT TINDLEY, THE BASIS FOR "WE SHALL OVERCOME"? "And you shall know the truth, and truth shall make you free." Since 1960, the music publishing company, Ludlow Music, Inc., which is owned and controlled by New York based, The Richmond Organization (TRO), has claimed ownership and control of all legal and commercial rights to the anthem of the African American Civil Rights Movement and globally revered freedom song known as, "We Shall Overcome". -A song which the US Library of Congress has named, "The Most Powerful Song of the Twentieth Century"
The 1960 and 1963, US copyrights of , "We Shall Overcome" were registered by Ludlow Music, Inc. which is owned and controlled by, "The Richmond Organization" (TRO). Folk singers, Guy Carawan, Frank Hamilton and Zilphia Horton were listed as "adapters" on the 1960 copyright. Following Martin Luther King's "March on Washington",folk singer, Pete Seeger's name was added to the 1963 copyright as an additional "adapter". In their respective copyright applications, both of the 1960 and 1963 copyrights are listed, not as original works, but as "arrangements" of a "previously registered work" entitled, according to the applications; "I'll Overcome". Although The Richmond Organization has at times asserted that, "We Shall Overcome" was derived from, "I'll Overcome Someday" by Rev. Charles Albert Tindley, both they and Pete Seeger privately affirm that Tindley's sacred hymn--beautiful as it may be-- is NOT the basis for, "We Shall Overcome". Tindley's hymn in in fact radically different from, "We Shall Overcome". 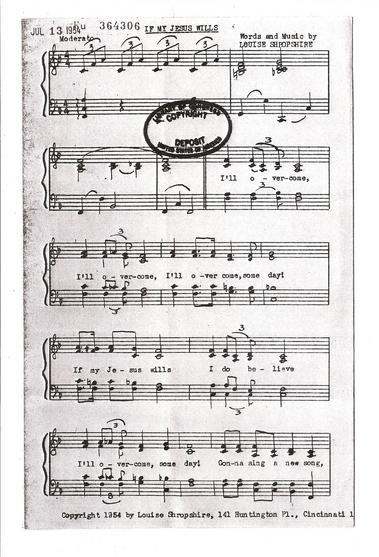 The following video features Tindley's "I'll Overcome Someday" performed from the original sheet music. The only basis for consideration of Tindley's hymn as the song from which, We Shall Overcome was derived are its lyrics. However similar to We Shall Overcome they may be, Louise Shropshire's lyrics are much more similar to We Shall Overcome. In addition, Louise Shropshire's, "If My Jesus Wills" is substantially more similar to, "We Shall Overcome" rhythmically, harmonically and musically. US Copyright Law defines "musical arrangements" as "Derivative works". The 1960 and 1963 US Copyrights of, We Shall Overcome, which were registered by Ludlow Music, Inc. et-al, are legally considered, "Derivative Works". "Only the owner of copyright in a work has the right to prepare, or to authorize someone else to create, an adaptation of that work. The owner of a copyright is generally the author or someone who has obtained the exclusive rights from the author. In any case where a copyrighted work is used without the permission of the copyright owner, copyright protection will not extend to any part of the work in which such material has been used unlawfully. The unauthorized adaption of a work may constitute copyright infringement. " Although required by US Copyright law prior to registering their "adaptations" of We Shall Overcome, no authorization from the author of the "previously registered" work was secured by Ludlow Music, Inc., The Richmond Organization, Guy Carawan, Pete Seeger, Frank Hamilton or Zilphia Horton (Deceased in 1956). This fact alone, according to US Copyright Law, renders NO COPYRIGHT PROTECTION to the 1960 and 1963 Ludlow copyrights of "We Shall Overcome". The 1960 and 1963 Ludlow et-al US Copyright applications expressly exclude, "Verse-1" from the "New Matter", which PETE SEEGER, GUY CARAWAN, FRANK HAMILTON and ZILPHIA HORTON (Deceased in 1956) claim to have added to the "previously registered" song. For all intents and purposes, not unlike the principal stanza to the popular song, "Happy Birthday to You", the world universally recognizes the aforementioned, "Verse 1" to be the essence of the song known as, "We Shall Overcome", from which the song derives its full meaning, narrative and purpose. Prior to registration, as evidenced by their 1960 and 1963 US Copyright applications, The Richmond Organization (TRO), as owners of Ludlow Music, Inc., along with Pete Seeger, Guy Carawan, Frank Hamilton and Zilphia Horton, demonstrated prior knowledge that they did not own rights to "Verse 1" of We Shall Overcome. In 1960 and 1963, Ludlow Music, Inc. / The Richmond Organization et-al registered Copyrights of We Shall Overcome with knowledge that they had not received express authorization from the author of the "pre-existing work" to create or register their derivative work. Ludlow Music, Inc; The Richmond Organization, et-al registered the 1960 and 1963 copyrights with the WILLFUL INTENT to engage in business activity for profit. The US music publishing industry is valued in excess of 2.2 BILLION dollars annually. The Richmond Organization (TRO) has unmatched power and market influence in the music publishing industry. The NMPA is arguably the most powerful music publishing lobbying organization in the world and represents the top five music publishing companies; Sony/ATV, Universal, BMG, Warner/ Chappell and Kobalt. Collectively these industry giants control approximately 11 million songs worldwide. According to, OpenSecrets.org, In 2015, the NMPA spent 715,000 on their US lobbying efforts. For more than half a century, TRO's enormous industry presence has allowed it to openly claim and assert rights to, We Shall Overcome and collect massive royalties and fees from its exploitation. "Pete Seeger has always been a socially conscious songwriter. Inspired by the movement, Seeger wrote, We Shall Overcome based on an old spiritual." Based on the facts listed above, We Shall Overcome Foundation holds that, since 1960, The Richmond Organization, as owner of Ludlow Music, Inc. has illegitimately and unlawfully claimed legal and commercial rights and control to "Verse 1" of, We Shall Overcome. For more than half a century they have asserted their considerable market power and influence to commit willful copyright infringement and fraud. By applying financial intimidation, they have collected millions of US dollars, both nationally and internationally, in royalties and license fees for the song's use in television, films, music recordings and public performances. They have also exerted their centralized organization by denying and severely restricting the use of, We Shall Overcome by filmmakers. "There are many other songs associated with the Civil Rights Movement which you could use in place of We Shall Overcome if circumstances are such that you cannot afford to pay appropriate license fees. -Larry Richmond"
In the end, so as not to endanger the film's release with the threat of a potential lawsuit, the producers of LDTB payed $15,000 under protest, for a three second clip of We Shall Overcome. --A clip which, for all intents and purposes, is indiscernible in the film. Not exactly 'blood, sweat and tears'. So then, if neither Ludlow Music, Inc., The Richmond Organization, Pete Seeger, Guy Carawan, Frank Hamilton or Zilphia Horton own, We Shall Overcome, who DOES? YOU DO. I DO. WE DO! Although hidden for half a century, the evidence has now been unearthed and it is overwhelmingly and abundantly clear. We Shall Overcome is not now, nor has it ever been the exclusive property of Ludlow Music, Inc., The Richmond Organization, Pete Seeger, Guy Carawan, Frank Hamilton or Zilphia Horton. We Shall Overcome belongs in the Public Domain for all the world to sing, record, publish and perform without cost. So then, if not Pete Seeger, Guy Carawan, Frank Hamilton or Zilphia Horton, who is the original author of, We Shall Overcome? 'We Will Overcome' [as taught to Pete Seeger by Zilphia Horton in 1947] is the precursor of 'We Shall Overcome' which was copyrighted in 1960." In conducting research for his book, We Shall Overcome: Sacred Song On The Devil's Tongue, which describes in extraordinary detail just how the misappropriation of Louise Shropshire's sacred hymn was carried out, author, Isaias Gamboa discovered a 1947 recording of Zilphia Horton (listed as one of the adapters of We Shall Overcome) singing a song she called, "We Will Overcome". Upon immediately recognizing the striking resemblance to Louise Shropshire's hymn, "If My Jesus Wills" (composed between,1932 and 1942) and Horton's performance of, "We Will Overcome", Gamboa sent the recording and sheet music to two independent musicologists. He then, independently asked each of the experts to transcribe the recording of Horton's, "We Will Overcome" (WWO), then conduct a musicological comparison between the WWO transcription and the US Copyright Office deposit Copy of Louise Shropshire's, "If My Jesus Wills". The reports and subsequent conclusions, drawn by both experts leave no doubt that Louise Shropshire is the previously unrecognized, "original author" of We Shall Overcome. The results affirm that Shropshire's sacred hymn, "If My Jesus Wills" aka "I'll Overcome"--composed between 1932 and 1942 and copyrighted in 1954, is the direct precedent to "We Will Overcome" as sung by Zilphia Horton in 1947. 1. "I'll Overcome" by Rec. Charles Albert Tindley in NOT the basis for "We Shall Overcome". 2. Zilphia Horton's 1947 recording of "We Will Overcome". 3. 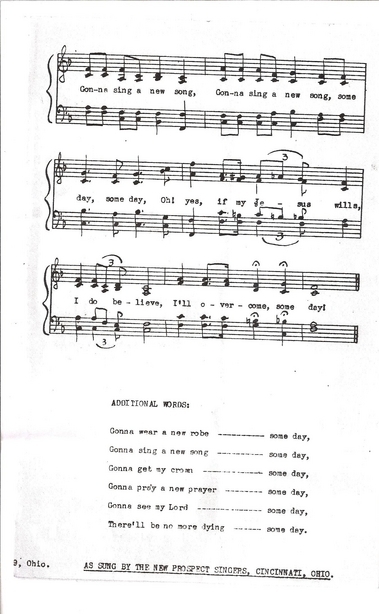 Transcription of Zilphia Horton;s 1947 recording of, "We Will Overcome". 4. Douglass Easterling's musicological comparison of Zilphia Horton's 1947 recording of "We Will Overcome" and the U.S. Library of Congress deposit copy of Louise Shropshire's, If My Jesus Wills. 5. Stephen Goukas' musicological comparison of Zilphia Horton's 1947 recording of "We Will Overcome" and the U.S. Library of Congress deposit copy of Louise Shropshire's, If My Jesus Wills. 6. 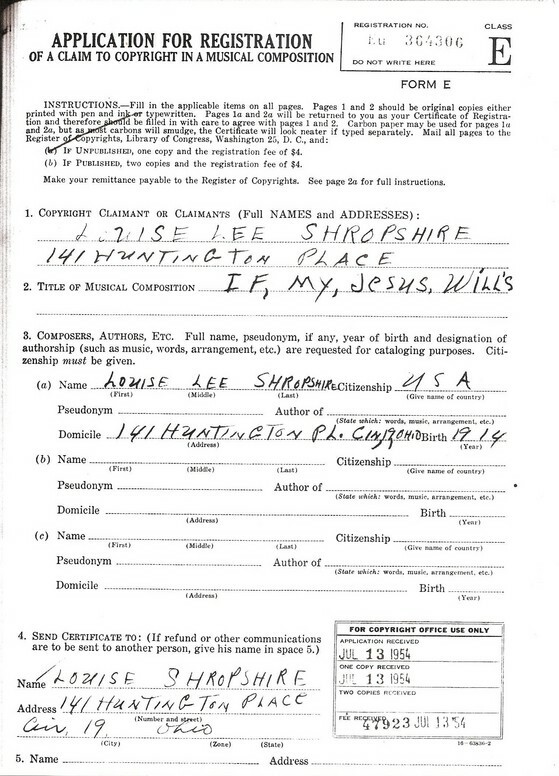 U.S. Library of Congress deposit copy of Louise Shropshire's, If My Jesus Wills. 7. Performance by the Azuza Pacific University Gospel Choir of Louise Shropshire's, "If My Jesus Wills" aka "I'll Overcome"
8. Performance by former members of Louise Shropshire's, "Rosebud Choir" Gospel Choir singing the "Morning Star" arrangement of, "If My Jesus Wills" aka "I'll Overcome". 9. Performance by former members of an African-American mass choir singing a traditional arrangement of, "If My Jesus Wills" aka "I'll Overcome". Former General Manager of, The Richmond Organization, Al Brackman confirms that, "I'll Overcome Someday" by Charles. A. Tindley is NOT the basis for, "We Shall Overcome"
Louise Shropshire's "If My Jesus Wills"